I’m going to keep this week’s post short and sweet. We woke up early this (Wednesday) morning to a Texas-sized thunderstorm and then promptly lost our internet. After a busy morning, I finally spent over three hours talking to two people from our internet provider and one person from Netgear, who makes our router, only to find out the router was toast and we needed a new one. My husband and daughter made a trip to Target to get a replacement. (You can always rely on my husband to replace electronics instantly and my daughter to agree to tag along to Target.) Now it is late, so I’ll just give you the basics. 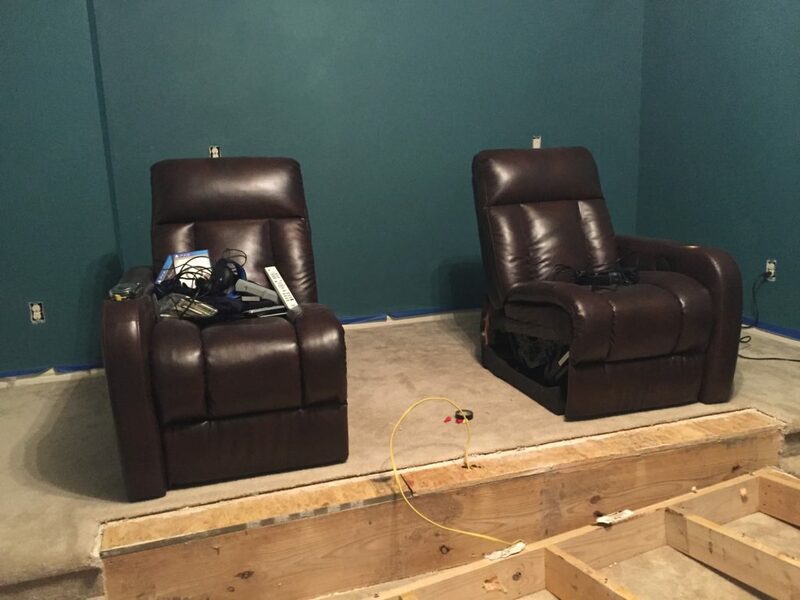 This is week four of the six week One Room Challenge and I’m tackling our Media Room. If you missed the first three weeks, you can see them here , here and here. This week I started sewing the theater curtains that will surround the screen. I had a few set backs, like my cats and two broken sewing machines, so they’re not hanging yet, but hopefully they will be soon. 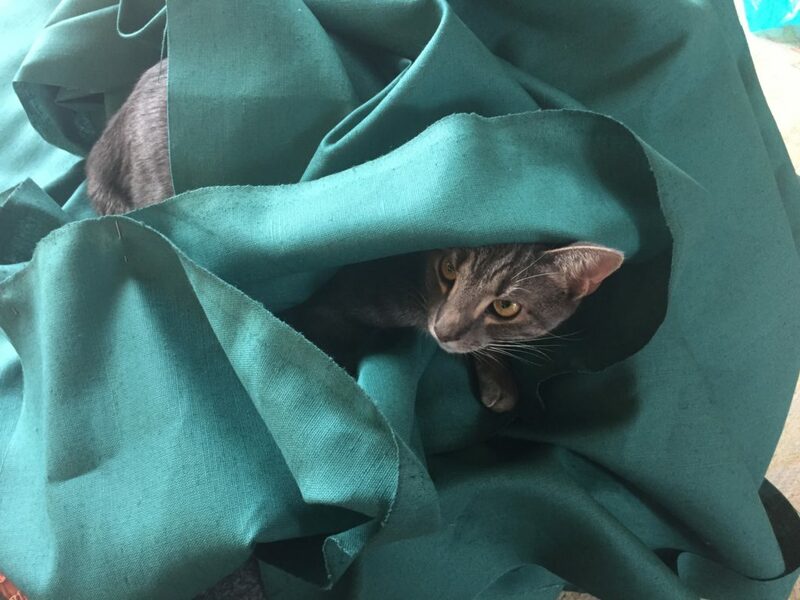 My cat, Meredith, impeding the curtain progress. 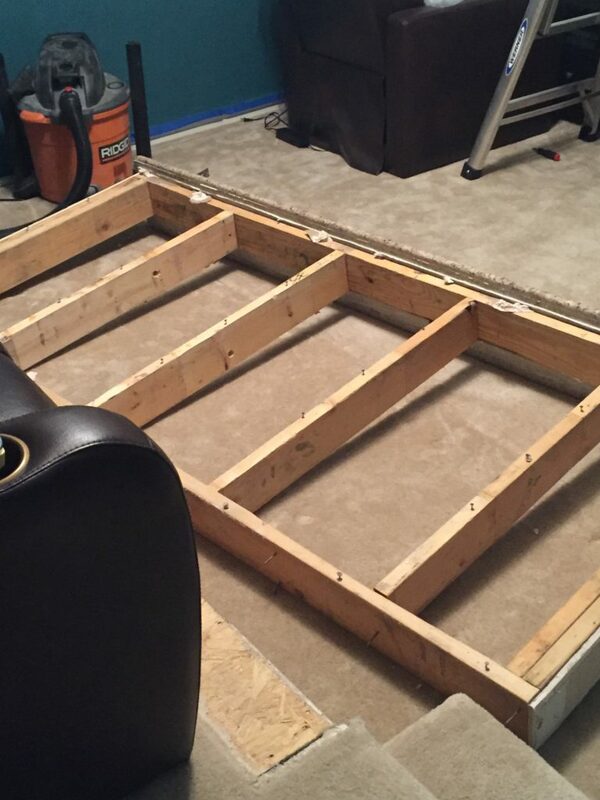 I also finished demoing the half wall. You can see in the photo below that I now have an issue with the carpet. I’m going to attempt to patch the missing carpet. We’ll see how that goes. If it doesn’t go well, I may be replacing all the carpet at the last minute. Ding dong, the wall is gone. I have a little issue with the carpet. 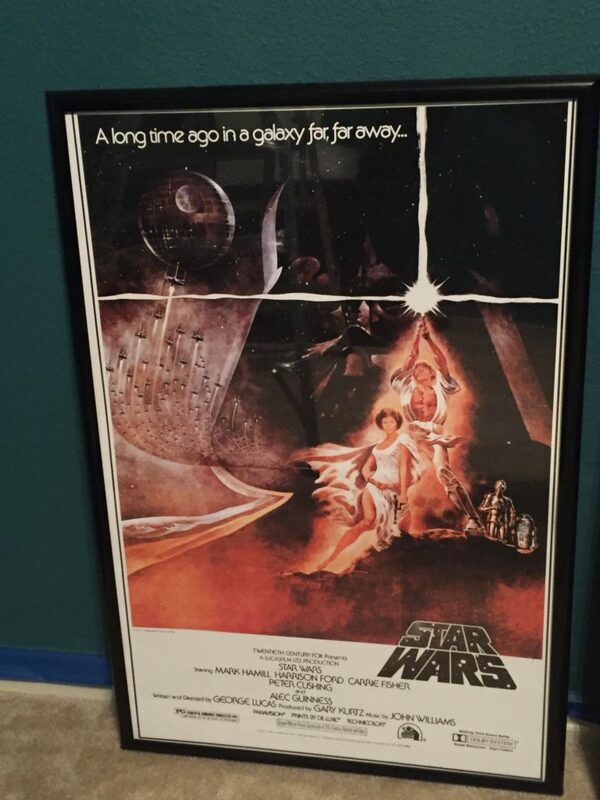 Lastly, I started framing the movie posters that I’m hanging in the space. Here’s a sneak peek. May the (ORC) force be with you. I’ve also had an issue with hiring an electrician. I want to add sconces on the side walls and I’ve contacted three electricians, two of whom I’ve worked with a lot before, but no one’s calling me back. Grrr… Building in our area is booming, and I know these guys are busy, but at least call me back! So this coming week I will have the theater curtains hung, hopefully I’ll line up an electrician and get the sconce installation on his schedule, and patch the carpet. 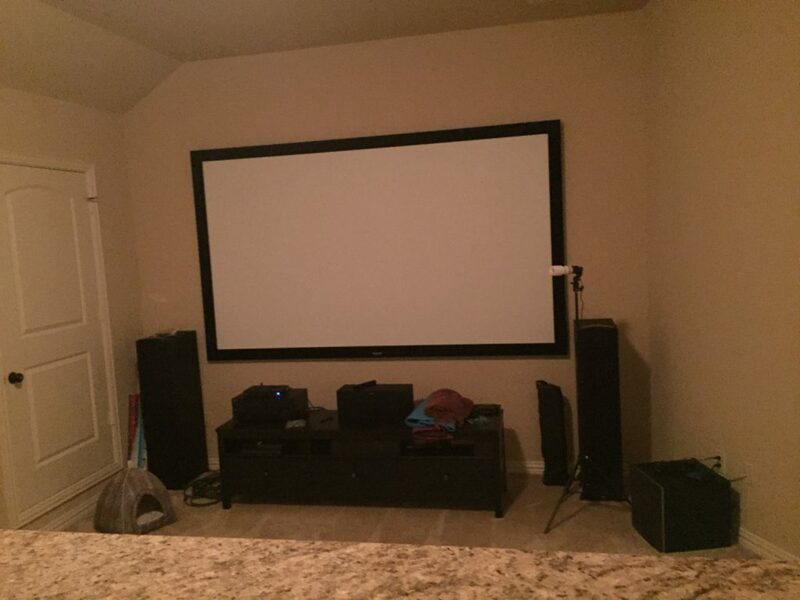 I also want to figure out how I’m going to store the media equipment under the screen. Before it looked terrible and I’d really like it to look more built-in. Current messy situation under the screen. Thanks for reading. Please visit the ORC Wednesday participants and the other Thursday guest participants. Have a good week! 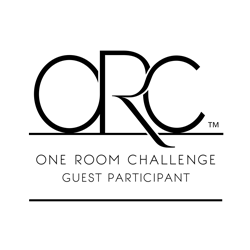 Yep–sounds like you’re experiencing the “challenge” part of the challenge! Hope those electricians call back soon! Two returned my calls the next day!